Affordable Accoutrements: Simply Vintage Table Setting! I set a simple table for you today, using mostly vintage items. My goal was to keep the overall look clean, functional, and uncluttered. No fine china, no candelabra, no place mats/tablecloth, no chargers, no place cards, no delicate crystal -- although I very much like ALL those things! The centerpiece is elevated. This serves a twofold purpose, preserving precious space on the tabletop and facilitating guests' conversation and visual interaction. And, OK, it looks rather dramatic. The dishes are "Countryside" (1966-68) from Enoch Wedgwood. Wikipedia: Enoch Wedgwood (1813-1879) was an English potter, founder in 1860 of the pottery firm Wedgwood & Co of Tunstall, Stoke-on-Trent. He was a distant cousin of the famous potter Josiah Wedgwood, of Josiah Wedgwood & Sons, but their two businesses were separate concerns. Wedgwood & Co was renamed Enoch Wedgwood (Tunstall) Ltd in 1965 and in 1980 it was taken over by Josiah Wedgwood & Sons, who renamed it Unicorn Pottery. The silverplated flatware is "Leilani," produced by 1847 Rogers Brothers from 1961-68. I'm sharing some recent Goodwill finds today. I couldn't believe my good fortune when I saw this elegant little glass bowl with silver overlay. I've purchased similar pieces at antiques shops and estate sales; I had never seen one priced at only $1.49! This one appears to be "Blossom Time." Is it unseemly behavior to lunge for an item on a shelf in a thrift store? Perhaps, but I make no apologies! Don't we all love the thrill of the hunt? A few days later, at the same GW, I found the creamer and sugar bowl below. Forty-nine cents each, and in perfect condition! The sugar bowl still has the original manufacturer's sticker. It reads, "Sterling on Crystal. Non tarnishing." I researched the Silver City pattern, and it's called "Forest." Silver overlay glass has a design in silver "electroplated" onto the glass using one of several electrolytic techniques. Silver deposit glass was first made during the late nineteenth century. Solid sterling silver is applied to the glass by a chemical method so that a cutout design of silver metal appears against a clear or colored glass. It is sometimes called silver overlay. 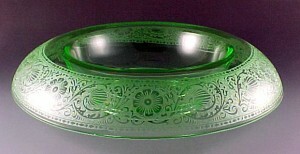 Silver overlay glass was made in two distinct periods. The first was from about 1890 to the First World War. From 1895 to the late 1920s, this elegant and exciting manifestation of the glassmaker and silversmith's art garnered its own avid following, just short of becoming a decorative rage. Silver overlay and silver deposit were regarded as an exquisite, special gift or accent for that certain table or shelf. A few nice pieces of overlay were as evident in the genteel home as a piano in those days of refined, yet simple pleasures. The Great Depression caused many of the glass companies to either go out of business or resort to specializing in cheaper, more affordable glassware. A revival followed immediately after World War II that lasted until the 1960s. For fashionable young couples getting married after World War II, this type of decoration raised the appreciation of any piece of glass from middling to marvelous. And closer still. I perched a thrifted glass bowl atop a wrought iron candleholder. The bowl has a hollow metal base that accomodates the spike (which normally secures a pillar candle). I placed a metal ring pan inside the bowl and filled it with wet floral foam. A few strips of Scotch tape across the top of the pan secured the foam in place. The free-flowing arrangement is mostly greenery trimmed from shrubs and vines in the garden. I also included early-blooming hellebores and wonderfully fragrant, but visually unassuming, winter honeysuckle. The vintage 1930s/40s stemware was etched and distributed by the Rock Sharpe Company on glass "blanks" produced by the Libbey Glass Company. The Poole console candlesholders were an estate sale find (very affordable!). They’re nice and heavy and have the look and feel of old family silver. The Rock Sharpe stemware is sturdier than it appears. It has Libbey's patented safedge rims that reduce the liklihood of chipping. The smaller glasses were intended for juice, but work well for oyster/shrimp cocktail appetizers or for serving cool, refreshing mousse parfaits for a light dessert. The vintage cloth napkins are from local estate sales. The Towle silverplated bread tray was another Goodwill find. The centerpiece was inspired by a local (now retired) professor of art history and interior design. He used to joke that his "derangements" cost nothing to make, and he kept the university's shrubbery nicely pruned. I served on a committee with him and learned from watching him create the effect of exuberant opulence at minimal expense. Take a trusty pair of garden shears; add energy, effort, and intuition; and it can go a long way toward creating a festive ambience and a truly memorable evening. Just a few more words about the silver overlay pieces I shared today. The sugar/creamer and the bowl were decorated and sold by the Silver City Glass Company. The bowl's shape and the clarity reminded me of Duncan & Miller and Heisey products. Silver City Glass Company-This company in Meriden, CT operated 1905 to the 1980s. They applied silver and gold decorations on glass of most major glass companies of the period. Silver City used a store display and sticker showing "Sterling on Silver" on a blue background. Silver overlay with a flying bird and cattails was applied by this company on Heisey Lariat, Victorian, and other patterns. Silver City glassware was considered expensive (by middle class standards), and it was sold in jewelry stores. Do you collect silver overlay glass? Did you inherit family pieces? I'd love to hear about your collections. 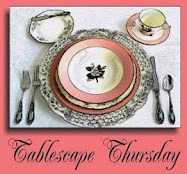 I hope you'll join Susan of Between Naps on the Porch for Tablescape Thursdays! The first sentence: "I set a simple table for you today...." made me smile a lot. Allright, Wedgewood pottery is maybe not the same as fine china although it has a good quality and maybe Rogers Broth. 's "Leilani" is only plated, it has a very fine design also. But the stemware is exquisit and so are the silver overlay pieces. Your centerpiece with fresh flowers is opulent. So it came as expected, when Bill is setting a simple table, it turns out again as a very fine and classy setting. Thank you for the interesting informations about silver overlay. I have seen such glasware often but always expensive. Have a great weekend. A beautiful decorated table, but the cups are special to me, are wonderful! Kisses and happy new week dear Bill! Your "simple" table is simply gorgeous! As always. Love your silver overlay and the centerpiece is quite wonderful. Oh, I love that dramatic centerpiece! And you make it sound so easy! I will have to take a little walk around my yard (and my campus) with clippers in hand. My father-in-law (now a retired prof) used to "shop" the campus for his lovely centerpieces, too. His magnolia arrangements were to die for! Thanks for the lessons on glassware, too. Bill, I love this kinda of "DRAMA"! And your great finds @ GW,makes me so jealous with envy, we don't have GW around here, or I should say, we have GW, but nothing ever seems to get put out for us, I think the peeps working there, snatches up all the good stuff. I learned so much today! Thank you. And you gave us a delicious feast for the eyes. Our GW is horrid, have nevah-evah made a purchase there. You are quite lucky to find all your treasures. Your centerpiece is really dramatic and amazing. I need to start thinking outside the box. Love your dishes. Love the glasses, love the silver overlay pieces. What's not to love!!! Coming to visit is always a highlight! Thank you so much for sharing your table art. there is nothing simple about this setting Bill. However, it is simply beautiful. Its great to see you back. I hope all is well my friend. You just gave me an idea for using the little round crystal pieces I have found at the thrift shop. Right now I use the two I have for placing the wine bottles on but I will look for some more and then serve an elegant dessert in a lovely dish and use them as mini chargers. Thanks Bill. Bill I never tire of looking at your incredible table settings. I love this centerpiece! Oh yes the thrill of the hunt in a thrift and yes I have lunged for a find myself! Beautiful! I wish we had such great "Goodwill" shops here in the UK. I love the bowl, creamer and sugar bowl. The centrepiece is excellent and all from the garden, even better!!! Your "simple" tablescape is simply beautiful. Jackie in Surrey, UK. How beautiful and elegant. The centerpiece is wonderful and aren't you lucky to have a fireplace in your dining room. Well Bill, everything you do is always breathtaking no matter what!! This is just beautiful and so elegant! I love the Wedgwood! I have been searching for red transferware for weeks and have seen that pattern in my search. The centerpiece is just fabulous!! I frequently keep my mother's shrubbery pruned for her! Thanks for stopping by a few weeks ago. My mother had back surgery so I have been there helping here and not able to get around to visit much. What a treat for the eyes!! Bill, your simple is so beautifully elegant. What a pretty china pattern. The centerpiece is amazing...so eye-catching. Hi dear Bill. Everything is so beautiful, as usually. I love your center piece, it is very dramatic as you say. The little bowl is so sweet and the Wedgwood, no words for it, simply gorgeous. Your pictures are spectacular! I enjoyed the simplicity of your tablescape today but with understated elegance nevertheless. How beautiful your arrangement and how you put it together. I always learn something from your posts of value. V.
So pretty! I love the centerpiece. I would get frostbite even cutting greens! Beautiful plates. I wonder when Libby stopped making fine glasses. Beautiful as always, Bill. My skills at arranging flowers are non-existent and I too cut lots of flowers and put into a big vase. I enjoy seeing your blue English dishes every time. My mom got a small plate for free at the grocery store when I was a kid. She didn't care for that sort of thing and used it under her flour sifter. The sifter and the plate are in our cupboard today. For a 'simple' tablescape that arrangement elevates your tablescape beyond simple! You certainly have a knack for flower arranging. I enjoyed your GW finds as I am not so lucky. I do have a piece of silver overlay glass. It's a bowl with handles and etched inside are strawberry vines. I use this at Easter and fill with strawberries. You don't see much of it in shops up North as most young people are not into it and it is not a big seller in antique stores. I can't take my eyes off the centerpiece. I love working with florals and this was such a great idea and "made" the tablescape in my opinion. I love using things I trim from the yard...although everything is still brown and dead around here. I always feel as if the table is too bare without placemats, runner or cloth. Yours doesn't look bare at all. Nicely done as always! Sometimes simplicity is the best! The color and design of the china plays off so nicely against the tone of the wood of the table. Love the centerpiece, dramatic yet simple, nothing competes...the eyes are at ease everywhere. Hi Bill, simply beautiful! I can't believe your Goodwill!! Love everything. Awesome again, Bill, and thanks for getting back to me about the silent butler! I'm so excited! Love the gorgeous centerpiece, and those beautiful plates! It's always a treat to come over and see what you have in store for us. You always have the most extraordinary tablesettings and arrangements. Simply elegant. Bill, your "simple" table is lovelier than my fancy ones. I love it, mostly because I really love that Wedgewood blue pattern. I also love your centerpiece and laughed at your former professors "derangement" comment. Bill, another GORGEOUS table, thank you, thank you, thank you. I love your "simple" - so elegant. Lunging is permissible at Goodwill; it is not proper practice to push, shove, or tackle. And sometimes I have to restrain myself! I never manage to spot the wonderful items that you find. It is your special gift, the twinkle in your eye that centers right on these treasures! I love learning from you! I will go back and look at some of the things my Mother left me, because I think I might have a piece or two of the silver overlay. Anyway, thanks for the lesson, you may have said your table is simple, but as always, it is dramatic and beautiful. I adore the centerpiece and all your pretties! Thanks so much for the lesson!! I do believe I have learned more about tabletop finery from you than anywhere! Each week I can't wait to see what you do next. You have a stunning blog.. I have never seen such beautiful set tables.. I found myself wishing I could be a guest.. your newest follower.. what a talent you have I can learn a lot about table setting from you! Hi, Bill! Beautiful from top to bottom! My husband recently busted me trying to trim so branches from a tree for a tablescape. I am still doing penance for that one! Your arrangement is really stunning and free flowing. When I look closely at the plates, its shape really partners well with the big tree. Nicely done! The china is, by the way, gorgeous! I can't recall having ever seen silver overlay glass, but I like it!!! As always, you got some incredible bargains and, no, it is not at all unseemly to lunge for what you want no matter where it is! At certain sale events, I actually wear steel-toed boots to get the upperhand if needed! :-) (Seriously...I really do! I'm not very tall and must assert myself by whatever means necessary. I'm sure I'm going to jail one of these days!) I love it that you let the natural beauty of the tabletop take a bow today. It's so pretty. Bravo, Bill! Have a fantabulous weekend! A charming table and the room is really lovely. Love the silver overlay glass. I love this room Your Tablescapes are all ways Beautiful you did a lovly job Bill~~~ Have a fantabulous weekend! Your Simple Vintage Tablescape is so nice. Two things I always love are blue and white dishes and English country scenes. They're just so old world and charming. I laughed out loud when you mentioned your retired professor's "Derangements". That is exactly like something my husband would say. He loves a good play on words and has his own "nicknames" for many things. We used to have a Reading China Store in our town that I LOVED to shop at until they went out of business in our state. My husband used to call it the "Redneck China". And he says his gray hair makes him look "extinguished" (as opposed to "distinguished"). At any rate, I also have to tell you that your "Lennox and Magnolias" post last week was just breathtaking! I would love to have those Lennox dishes -- so versatile and elegant. And the magnolia leaf placecards were just inspired. I thought it was especially nice that you had a "virtual" dinner party for some of the nice people you've met in Tablescape Thursday. I'll be on the lookout for their blogs now. 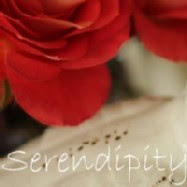 I just signed on as a new follower for your blog. Take care now! I fell off a small porch leaning over the railing to cut some greenery such as yours and broke my wrist in three places....however, I did this five years ago, long before you explained about your centerpiece. I always explain mine but with caution....LOL! Your "simple" tablescape is not as "simple" as some of mine, and knowing you and your tastes for lovely things, why would I be surprised! I love how the candlelight sparkles and adds such a soothing touch at the end of a long day. Perfection at its best in my opinion!! Bill, I love this table! I have a soft spot for your Countryside dishes, Lenten Rose (can't wait until my plants get big enough to use like this! ), and silver overlay. Your GW is obviously better than mine -- but I've been fortunate to find several pieces in auction boxes through the years. I've used some of them in tablescapes, including my debut tablescape. I can't believe what a "steal" you got - twice! They are beautiful. Way to go!!! This looks fantastic. Love the mostly all greens elevated arrangement! Would love to copy but we are still deep in the winter freeze up here in Illinois. Will have to wait another month before things turn green again. Thanks for the lovely inspirations!